With the discovery of fire, early humans noticed that aromatic smoke was produced by burning certain dried plants and wood. Throughout human history, plants and herbs have been used in many religions, spiritual practices, and cultures. Many believe that using the smoke that is burned with intent, can help clear out negative energy and purify. Using smoke to cleanse your home, office, body, or crystal collection is like a metaphorical washing away of negativity. The smoke changes the ionic composition of the air, which research has linked to a more positive mood. Smudging refers to traditional ceremonies for purifying and cleansing the aura or soul of negative thoughts and energy. Many cultures use an abalone shell to catch ashes so that the four elements are represented; the shell for water, the wood for the earth, the lighting the fire, and the smoke produced the air. The Spanish translation of Palo Santo is ‘Holy Wood’. It is a a type of tree native to South America and is in the same family as frankincense and myrrth. This wood has a smoky scent of mint, citrus and pine. It’s use dates back to the Incas who used it for it’s purifying properties. It is said to provide an uplifting scent that raises your vibration in preparation for meditation and helps clear away negative and stagnant energy from you and your space. It also acts as a natural insect repellent and is great to take with you when you go camping or will be sitting outdoors. Our Paolo Santo is from sustainable farms in Peru. If you have asthma or respiratory problems, burning anything may not be great for your health. Always remember to burn in a well-ventilated area and always be mindful of fire safety, especially indoors and in dry climates. Light the end by holding it at a 45-degree angle pointing the tip to the flame of a candle or match. Let it catch fire and start to burn for about 10-30 seconds. Gently fan out any flames with your other hand or let it go out on its own. Your stick should have a few embers glowing at the end and white smoke. You may need to relight several times to get the desired amount of embers and smoke. With the flame extinguished, pass your Palo Santo and the resulting smoke over people and objects; you can direct the smoke with a feather or with your hand. Most believe that you should go clockwise and from top to bottom. Establish what feels right for you and then work with this routine so that each time you smudge you are ensuring you are thorough. You may find it useful to use a heat-proof dish or shell below your stick to collect any ashes. Do the above in a slow and mindful manner. Remind yourself to stay connected to your breathing throughout your session. Take a moment of mediation to notice if the smell evokes a sense-memory for you. Where does that resonate in your body? With what chakra? Examine whether you feel a spiritual connection or an earthy, ancestral stirring within you. As you use the smoke in your room or on yourself, visualize the smoke taking away with it any negative energy from your life or any darkness. Once finished, let it burn out by itself or press into the heat-proof dish to extinguish any embers. Your Palo Santo stick is very slow burning. You will only use a small portion of it each time so you can use it multiple times. Treat any leftover ashes with intention. Take them outdoors and return them to the earth to complete the cleansing. Store your Palo Santo in an honoured and dry place in your home. It smells great even when not being burnt! You can use Palo Santo to smudge your crystals and gemstone bracelets....you can also use that powerful crystal energy too! 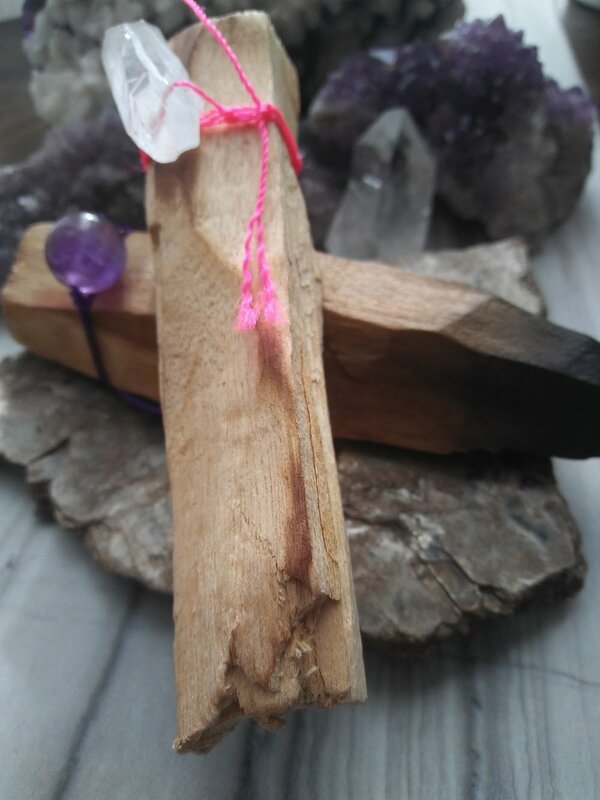 All our Palo Santo is paired with gemstones. All minerals have an ordered atomic arrangement which means they have an internal crystalline structure that is the same throughout. Each mineral has its own unique vibration and energy. When we bring them into our electromagnetic field or Aura, it is believed that the crystal can help us move, absorb, focus, direct, and diffuse energy within the body and our space. Their presence gives both your consciousness and subconsciousness helpful nudges whenever you use your Palo Santo.